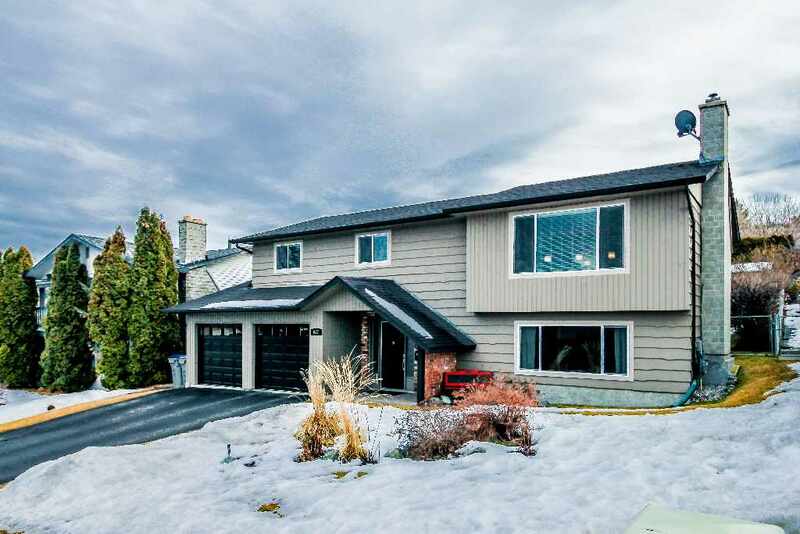 New Listing: 677 Laurier Drive, Aberdeen, Kamloops, BC $464,990. Nothing has been missed in this fully renovated home on desirable street in sought after Aberdeen neighbourhood. This home features: sprawling Excel kitchen with shaker cabinets and granite features, all stainless steel appliances, granite sink, lots of pull outs in the kitchen cabinetry with 12 foot island, laminate flooring throughout the main floor and new carpet in the bedrooms, 4 piece main bathroom fully renovated with granite countertop, 3 piece ensuite, gas fireplace in great room, bright rec room with large window and fireplace, two additional bedrooms in the basement with laundry room. Other updates include: HE furnace, Heat pump (central a/c), central vac (2015), hot water tank 2009, roof 2008, light fixtures, all windows, french doors, paint, 16×16 trex deck in back yard with koi pond and fully fenced yard with irrigation, 2 fruit trees and storage shed. 2 car garage with room for an RV. Perfect family home in a great location! Day before notice for showings re shift worker.